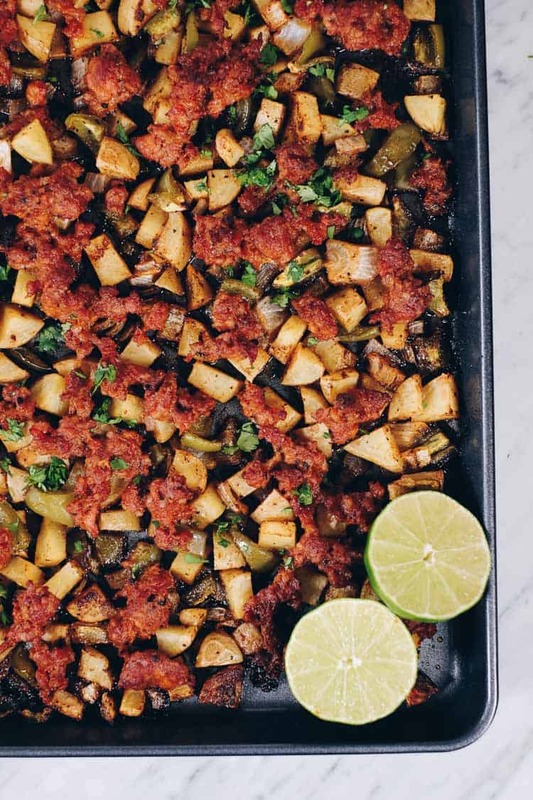 Welp, we love one pan dishes because let’s just be real….less dishes and less clean up are always a good idea! 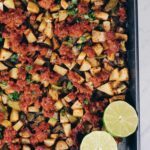 This one pan chorizo breakfast bake is also great because it is a fabulous make-ahead breakfast! We consider ourselves meal planning and prep people. We love getting ahead of the game and feeling organized, so the week goes smoothly and requires minimal effort. 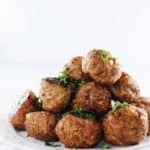 Make ahead breakfasts are definitely one of the easiest ways to make starting the day during the busy work week a breeze. 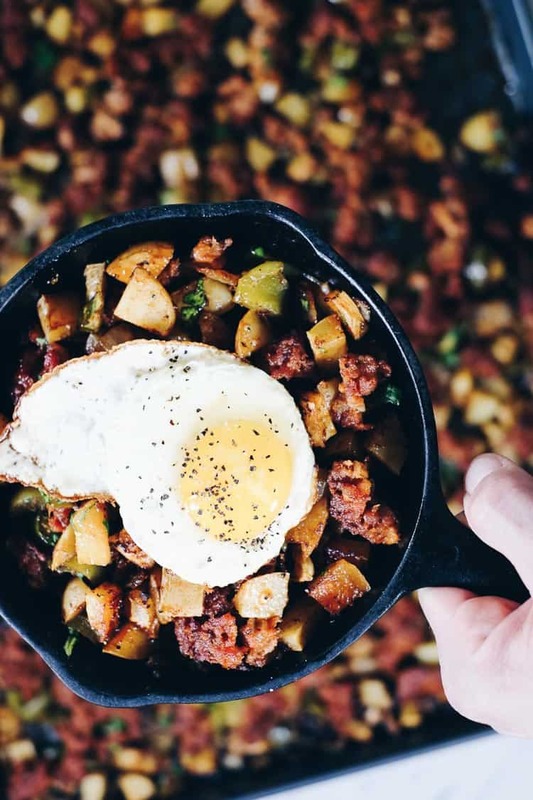 Spend a little time making a large breakfast like this one pan chorizo breakfast bake, and then just re-heat it in the early hours of the morning for breakfast. 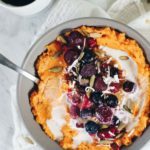 Your morning routine will appreciate the extra time you get back and also the minimal effort and dishes. Trust us, your morning self will thank you! Looking for a protein that packs the flavor? Well, our choice is chorizo! 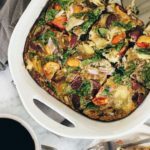 It adds so much flavor to any dish and then paired with potatoes and veggies in this one…so good! 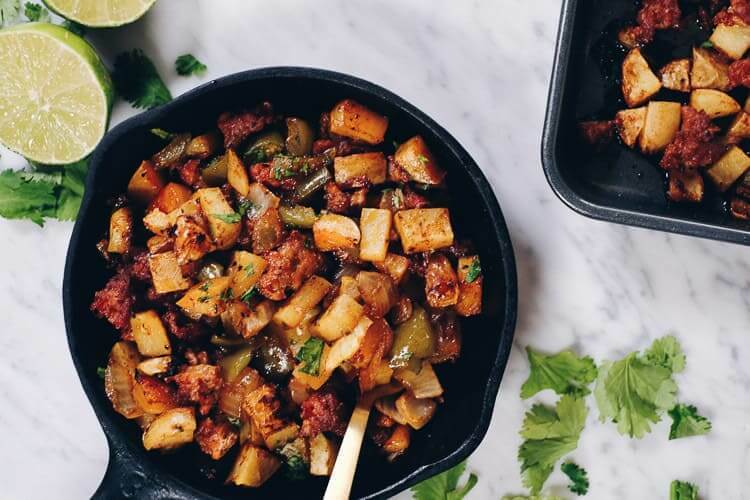 If you love Mexican food and flavors, you will almost certainly enjoy chorizo as much as we do. 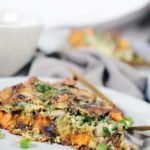 This is a make-ahead breakfast you will truly look forward to eating the leftovers of for breakfast in the morning! Now you definitely don’t have to put an egg on this one! 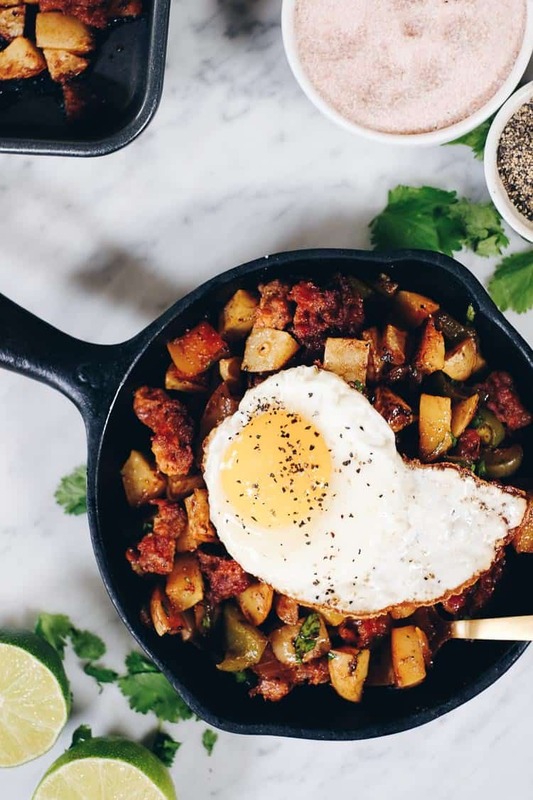 It is packed with protein and flavor, but if you are an egg person like Justin, you will LOVE the runny yolk mixed with the chorizo and potatoes. It adds that extra little pizazz taking this dish to total awesomeness. I think it is actually Justin’s favorite make-ahead breakfast. He lights up when we make it and actually enjoys eating it for breakfast all week long! Like no complaints about the same thing for breakfast every day, and he looks a little sad when it’s gone. 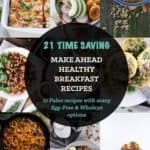 Looking to make your mornings a little easier? 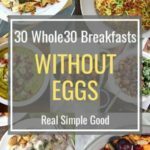 Want to still enjoy a tasty and satisfying breakfast? 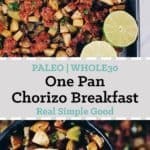 Make this one pan chorizo breakfast bake! Let us know how it goes by leaving a comment below. Also, take a photo and tag us on Instagram @realsimplegood, so we can check it out! 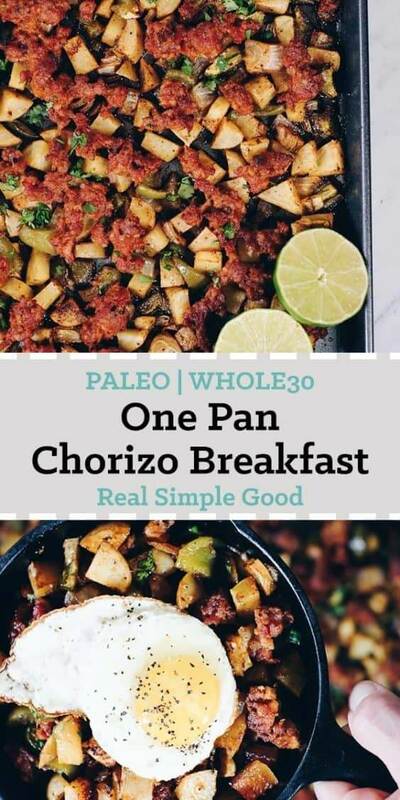 Spend a little time making this Paleo and Whole30 One Pan Chorizo Breakfast Bake. Just re-heat it for breakfast. Trust us, your morning self will thank you! Preheat the oven to 400° Fahrenheit and line one large or two medium sheet pans with parchment paper. Chop potatoes, bell peppers and onion as noted and place in a bowl. Add avocado oil and toss to coat. Add chili powder, garlic powder, salt and pepper and toss to coat. Spread the veggies out on the sheet pan. Break ground chorizo into small pieces with your hands and nestle the pieces of chorizo evenly among the veggies. Place everything in the oven to bake for 30-40 minutes, until potatoes are tender. Squeeze lime juice over the entire sheet pan and then top with avocados and optional cilantro for serving. Serve with an egg cooked to your liking if desired.